I need to work on an urgent affidavit and hence, am unable to update with a recipe at the moment. As per usual routine, I will highlight one of the other food reviews I have previously done and this time, it’s Gong Pian aka Gong Pia aka Kwang Ping aka Shining Biscuit. For purposes of this post, I shall just call it Gong Pian. Gong Pian is Foochow in origin. You can get these in Foochow, China or in Sitiawan and Sibu in Malaysia or wherever else the Foochow people decide to make this. 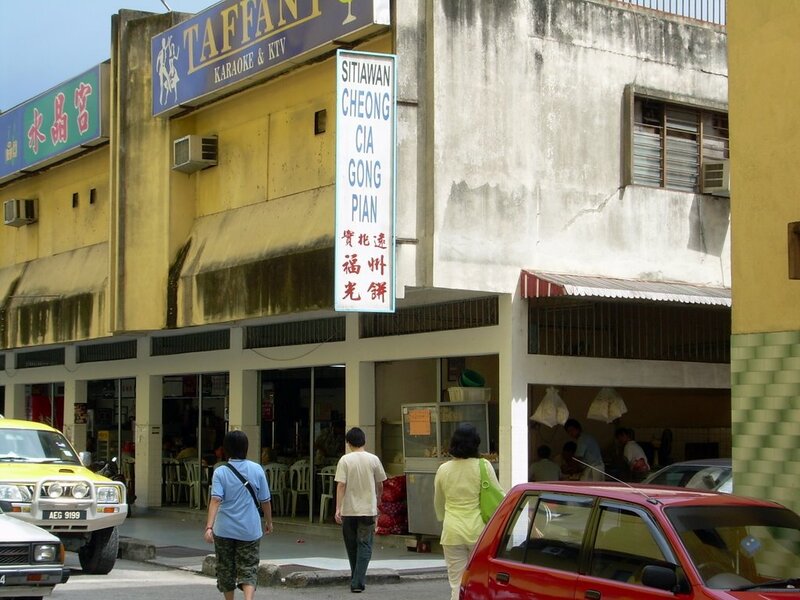 So folks, let me take you on the Gong Pian journey. Interesting pictures for you to see as well. During last Friday’s recce to Swiss-Garden Resort & Spa, Damai Laut, we stopped by in Sitiawan to buy some famous Foochow confectionary – Gong Pian! We were brought to this corner shop “somewhere” in Sitiawan and told that this shop is famous. Apparently, the gong pians sell like hot pias (literally). 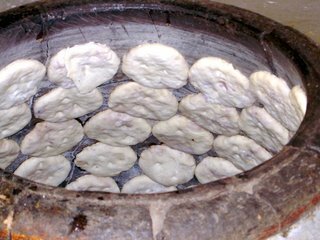 I also found out that these gong pians (no relation to Gong Li) are akin to naans as they are baked in a tandoori-like oven. 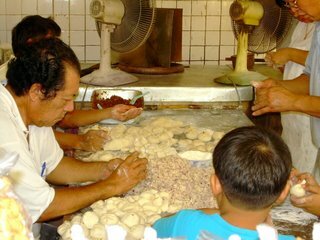 It is by no means an easy process as the baker has to lay them in neat rows in the sweltering heat of the oven, then sprinkle some water over the pians (oh, pian means biscuit) and heat them up evenly before flipping them over to heat up the other side. The baked gong pians are then removed and placed on the table top to be rapidly cooled by a table fan. I tell you, people buy them in 10s! Each oven can only accommodate 50 pieces of gong pia and there are only 2 ovens in operation at any one time. 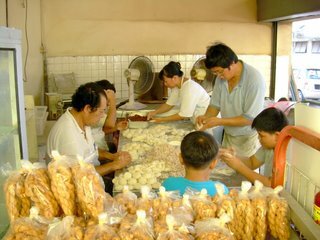 When I was buying my 4 pieces of gong pian (and I was rather embarassed seeing that others are buying them in 10s), 50 pieces being baked in one of the two ovens were reserved for a buyer who had made prior reservation. The gong pians are family-made. I see two brothers (their face looks alike) baking the pians and other members of the family helping with the stuffing of ingredients into the pian. 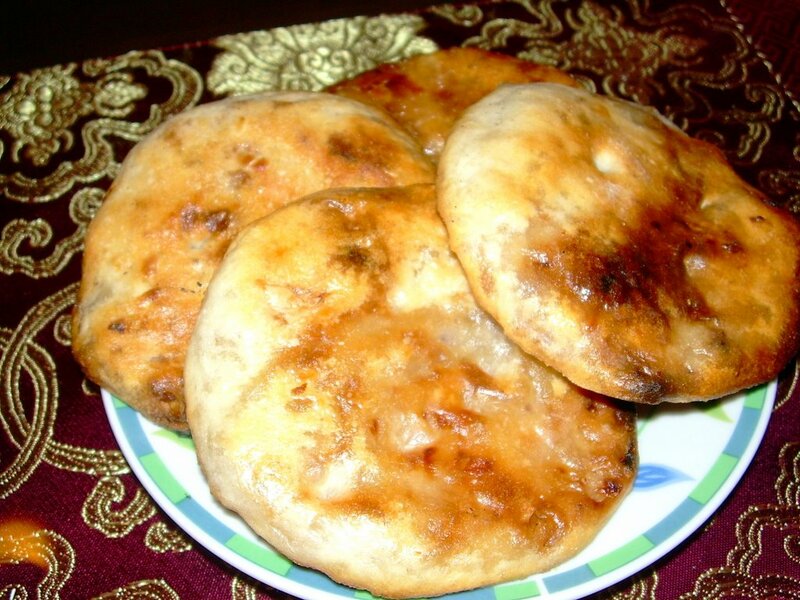 The stuffing which is made up of chopped onions and pork lard (I am unaware of other main ingredients) is placed into a rounded piece of dough before it is deftly wrapped into a small parcel, not unlike char siew pau. It is then flattened before being “pasted” onto the inner walls of the oven. Interestingly, just like the naans, the gong pians seem to defy gravity as they do not fall off the oven. It is as if the oven walls has got some form of magnet which allows the gong pians to cling to it. The end result is a fragrant smelling crispy on the outside crunchy on the inside biscuit which will make you crave for more and more! I did a Cookie Monster crunch (okay, okay, I exaggerated a bit) on one piece of the gong pian within 3 minutes of buying it and loved each bite. It is not that healthy though…considering the porky lard but hey, it’s okay when you are savouring probably the best gong pia in Sitiawan town! Hallo! So this is how westen kong pian look like. Different from the Sarawak vision. I will blog about it when have the chance! BTW yummy & tasty blog.Have a nice day! bengbeng : Got try it or not? horny ang moh : Yoohoo! Slight difference perhaps. Even their foochow slang is also slightly different from those in Sibu. I love gong piang too cos my MIL is from Sitiawan. However, the first time I bit into one, I was wondering, how in the world do you eat this stuff? By the time I ate it, it was cold, so it was very hard. I have no idea what Gong Pian is????? Is it similar to the one with sticky molasses filling in the middle? wahlau : Some Foochow food is quite famous. I like their mee suah (they call it “soh mee”). I always make it a habit to get some when I go back to Kuching. my parents visited me over the weekend and i specifically asked them to bring down a bag for me..
Foochow Gong Pia « she, the epicuriousgirl.